From glass jars used as drink tumblers to canning jars transformed into cannisters for food preserves, no one can contest the almost limitless flexibility of mason jars. With its rise in popularity among small business owners and craft hobbyists, new applications are being discovered for mason jars each day. If you are starting a food and beverage business built around these magnificent jars or expanding your craft hobbies into a moneymaking venture, why not take a step further and customize your own? Create your own jar labels with NextDayFlyers. With our wide variety of options, you can truly make your jars customized to fit your preferences. You can pick from two types, cut-to-size and roll, both with self-adhesive paper that can stick to most surfaces, your glass jars and jar lids included. 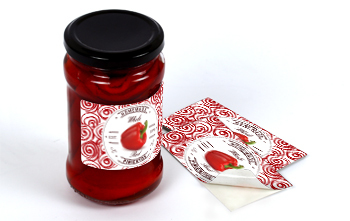 With our fast turnaround time, your jar labels can be ready as soon as the next day! Jar Labels is rated 5.0 out of 5 by 4. Rated 5 out of 5 by Casey from Excellent service Great price, plenty of options, fast delivery. Thanks. Rated 5 out of 5 by Sleeping Bear Honey from Excellent Company!!! I ordered jar labels for my honey crop this year. The labels were easy to order, I uploaded my photo and checked out! It was that easy. I got my labels in under 5 days and they were awesome! Exactly what I wanted. I will definitely be a repeat customer! Thanks nextdayflyers.com! Rated 5 out of 5 by vonhub from Wonderful Labels, Great Quality I ordered product labels 2x2 - and I am very happy with the quality and design. Would recommend for any type of labels needed. Great communication and fast shipping.